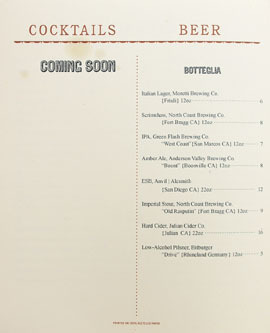 It's rather unfortunate that the most anticipated opening of the year in OC is merely a transplant of an existing restaurant in LA (and as of December 2010, Singapore). 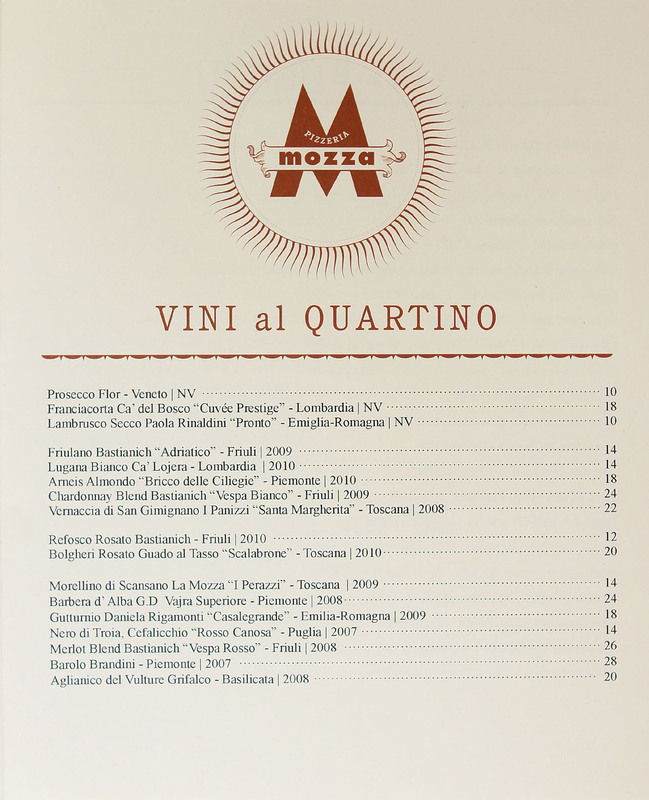 Nevertheless, Mozza is sort of a big deal, and this southern outpost of the Batali/Bastianich/Silverton empire was certainly worth a visit. 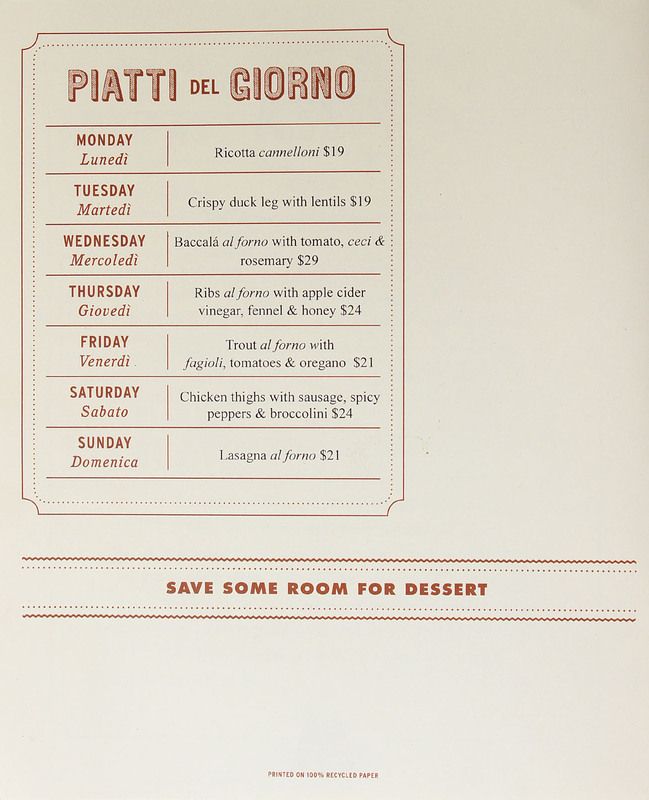 After some issues attaining a liquor license, the eatery debuted at the start of September, and Matt Molina from the first Mozza returns as Executive Chef, while Chef de Cucina duties are handed off to Emily Corliss, a veteran of the original location as well. Mozza sits on the ground that was formerly home to Dolce Ristorante Italiano, though Batali and company decided to tear down that building and start from scratch. 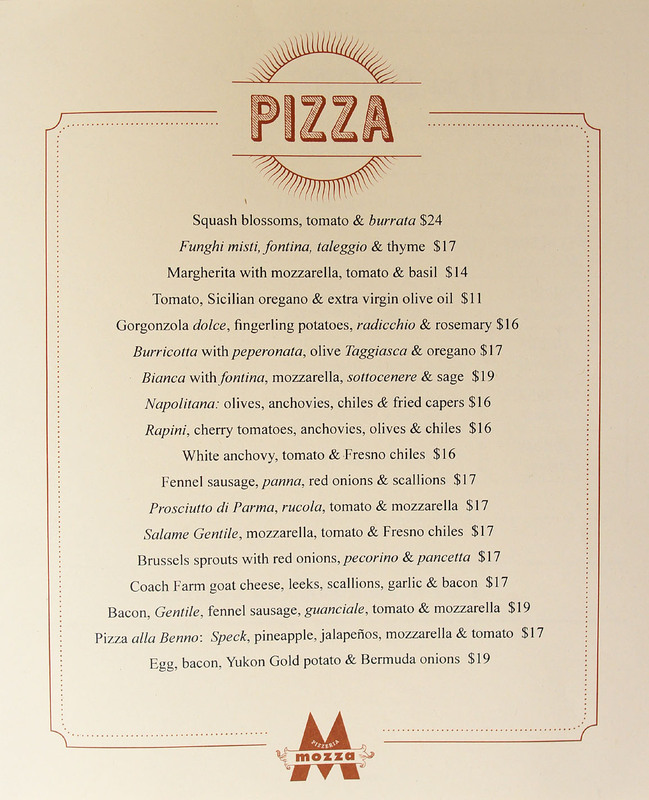 Newport maintains the warm, earthy vibe of the original, as well as its predecessor's pizza oven-facing counter, and also adds a full bar, something missing from the Los Angeles location (as Osteria Mozza next door has one). 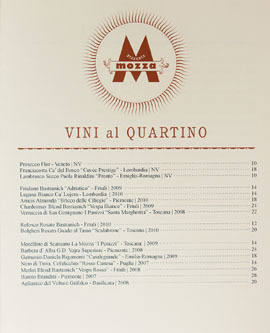 Mozza's menu, as expected, reads familiarly, and you'll find almost all your favorites from the Melrose eatery. Click for larger versions. 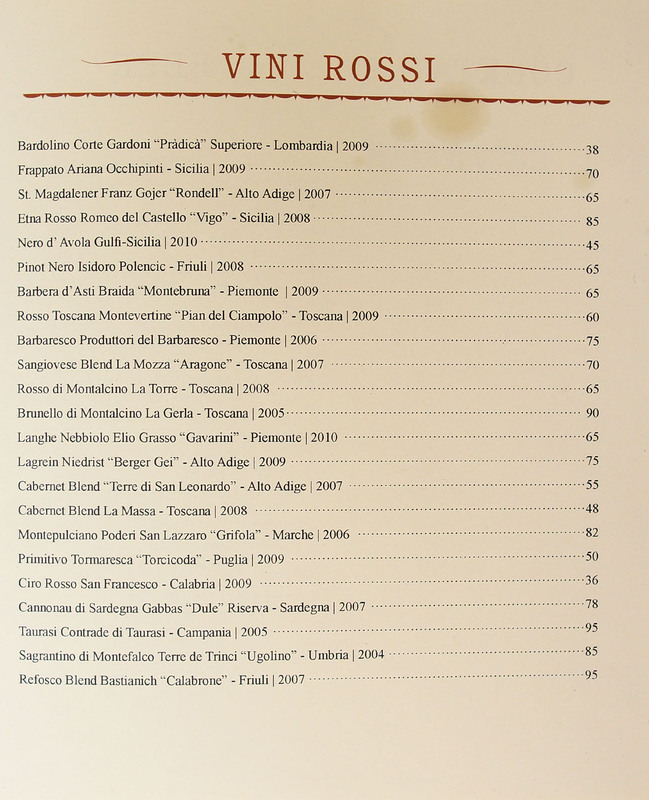 Appropriately, wines here are Italy-centric and reasonably priced. 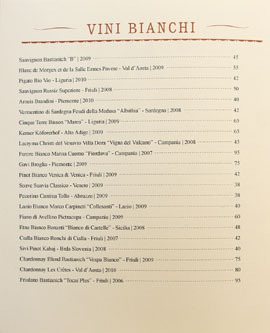 The vini is complemented by a handful of beers, while cocktails (by Lucas Swallows of Carnevino/Batali & Bastianich Hospitality Group in Las Vegas) will arrive when the restaurant receives its full liquor license. Click for larger versions. 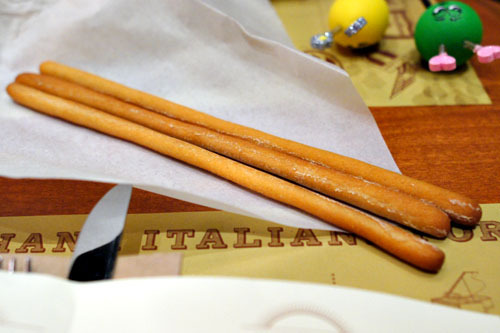 Grissini bread sticks take the place of normal bread service. We kicked off the meal with an octet of arancini, which are basically risotto balls coated with breadcrumbs and fried. They were nice, with a mild rice-y savor deftly augmented by the meaty, tangy Bolognese sauce. 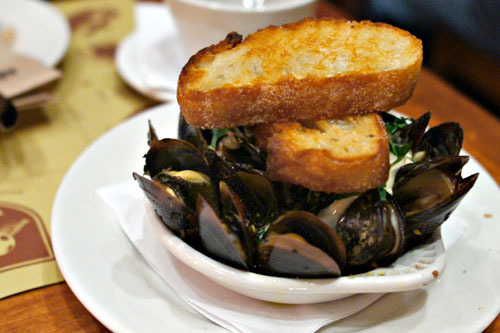 Mussels were impressive, showing off a lovely salinity that was perfectly countered by the dish's spicy, peppery base, while the toasted bread served to moderate the course. Next up was the most complex course of the night flavor-wise. Reading its description on the menu, I wasn't too keen on it initially, but really the dish was pretty interesting. 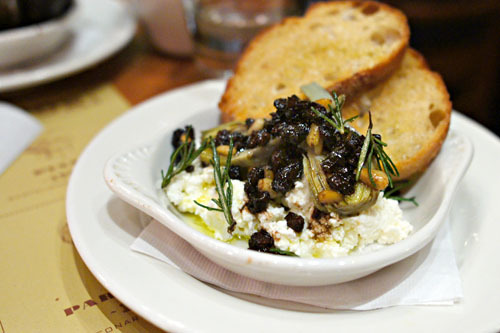 The ricotta definitely grounded things with its cool creaminess, serving as a stage on which the slight vegetal tang of the artichoke, the earthiness of the pine nuts, and the sweetness of the currants could really shine. Lovely mintiness from the herbs, too. 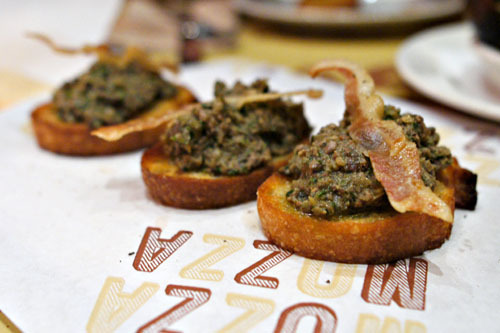 Rounding out our appetizers was a plate of bruschetta, topped with chicken liver. The aggressive relish of the fegato del pollo was moderated in part by the piquant bits of caper interspersed within, while the guanciale added a well-placed salty smack to the mix. I'd think twice about ordering this if you don't count yourself as a fan of liver though. The margherita is sort of the de facto order when trying out a new pizzeria, and tonight was no exception: when all you're dealing with is tomato, mozz, and basil, there's nothing to hide behind. Though not strictly napoletana in execution, the pizza was tasty nonetheless, with the tangy tomato working in concert with the cheese to great effect, all punctuated by overarching notes of peppery basil. As for the crust, it's baked for a relatively long time at a relatively low temperature, making for a crisp, toasty, puffy-edged character that I rather enjoyed. 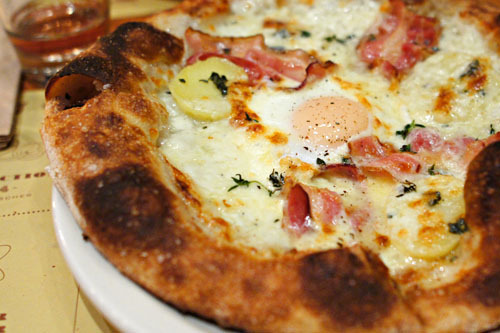 Egg, bacon, and potato, three of my favorite ingredients, all on one pizza? This was definitely a must-order. Our server likened this to a "breakfast pizza," and it did not disappoint, showing off a profound savoriness from the bacon and a gorgeous bit of lusciousness from the runny egg that went perfectly with the potato, onion, and cheese. You can't go wrong here. 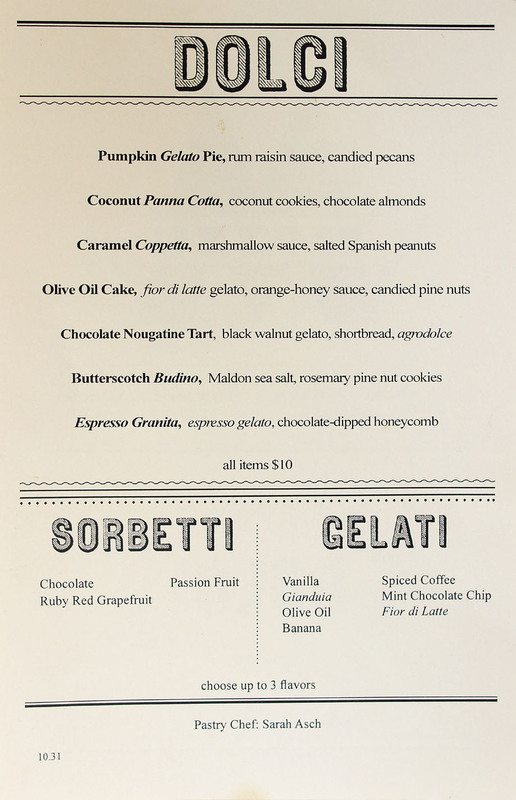 Desserts at Mozza Newport are the charge of Pastry Chef Sarah Asch. Click for a larger version. 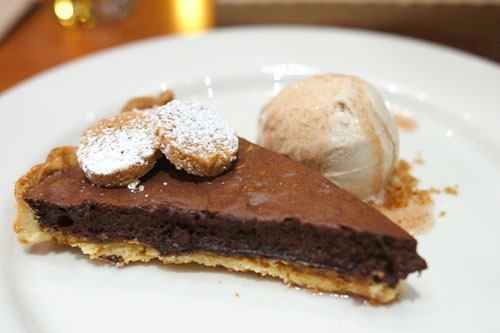 A chocolate nougatine tart actually was rather tart, thanks to the agrodolce. 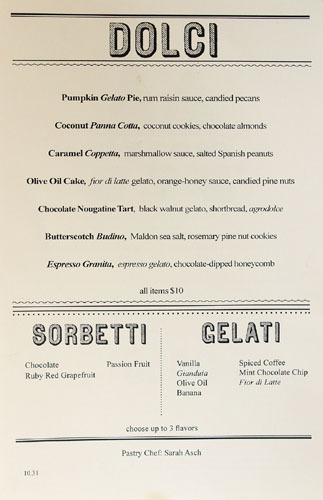 The sweet & sour notes of the sauce countered the sugariness of the chocolate nicely, and I appreciated the restrained savoriness from the walnut gelato as well. Lovely crunch from the nougatine to boot. Naturally, we had to end the evening with Mozza's famed budino, which, really, was as strong as ever. 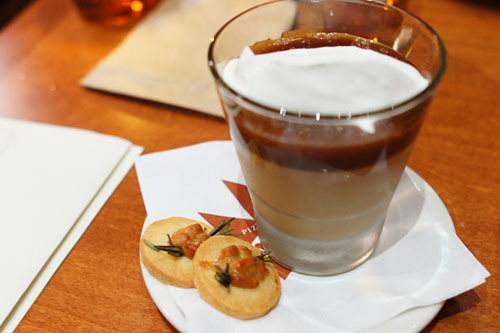 The interplay of the unabashedly saccharine pudding with the Maldon is a perfect example of mixing sweet and savory flavors, with the salt doing a fantastic job in balancing out the weight of the butterscotch. The cookies, meanwhile, added the fragrant tang of rosemary into the mix, and also served to provide some textural variation to the dessert. Very nice, as always. Two months after opening, Mozza Newport seems to be humming along just fine, dishing out straightforward, satisfying fare in a relaxed setting. I really have no complaints, save for the hassle of actually trying to get a reservation to the place. 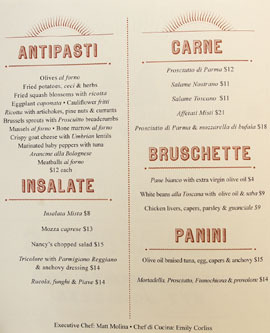 In the end, the restaurant is pretty much a carbon copy of the original up in LA, which really isn't a bad thing and probably already miles ahead of most Italian eateries in Orange County. Awesome. Glad that they kept it the same. 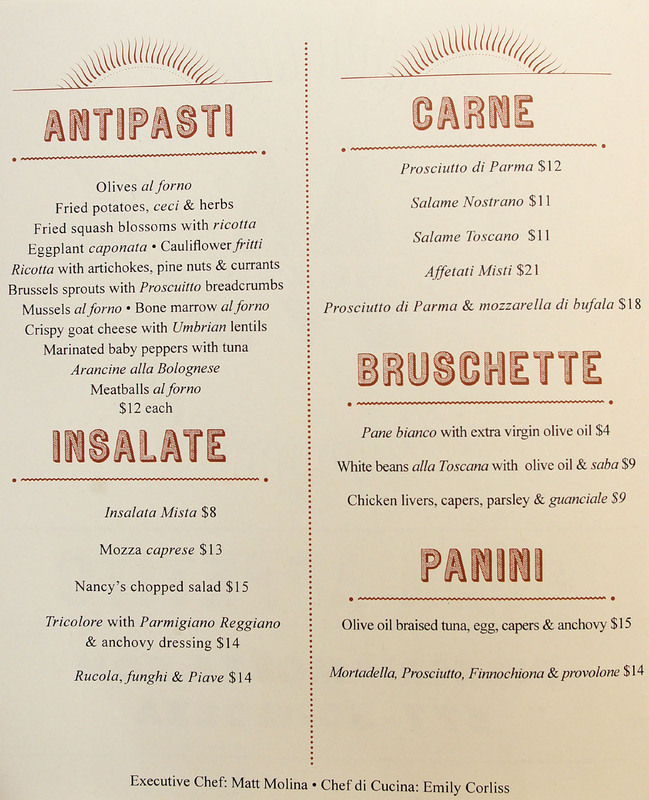 OC did need to step up their Italian cuisine and it looks like they will fit right in. Kevin!... 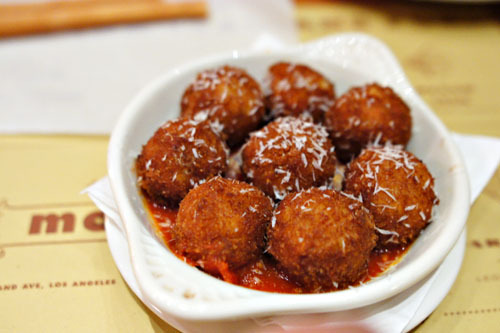 thanks for the blog... the aranice (risotto balls) sounds like a dish I make at home, so those are a must try and of couse the pizza! I have heard some very unfortunate reservation horror stories for Mozza. Like The Exorcist horror stories but minestrone instead of pea soup. Whether they were entirely true or not, I wish them the best! 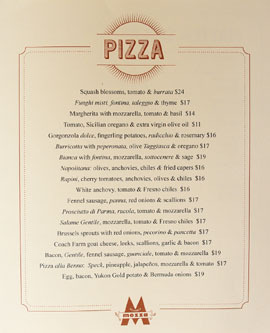 Very envious, I'm yet to be to a Mozza spot but I hear another one is being built in La Jolla. Hopefully it's ready by the time I come back. Franklin: Indeed. 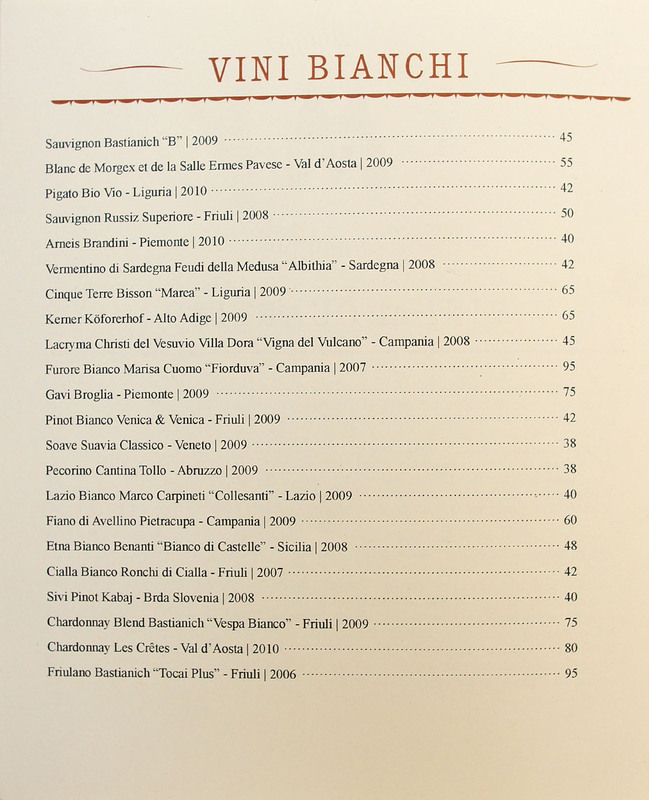 Do you have any other Italian recommendations for OC? Nothing really comes to mind for me. Yesi: If distance isn't an issue, I'd say go to the LA one. It's the "original," and seems to have less issues with service at this point (though our service was fine). Michael: What have you heard??? For me, it was just a matter of them not having availability. 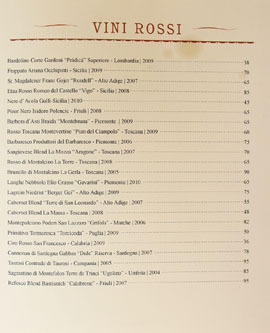 I do need to get back to the Osteria some time, though. Marian: How's Ortica holding up now that Matt and Zack are at Sotto? Ortica's pizzas were always more authentically Neapolitan I believe. Roddy: Yeah I saw that on Communal Table. When are you planning to head back to Cali? Kevin: Yelp has some pretty consistent personnel gripes. So, what's on the schedule for Friday night? My wife and I went last night and it was pretty awesome. Bone Marrow al forno was awesome. 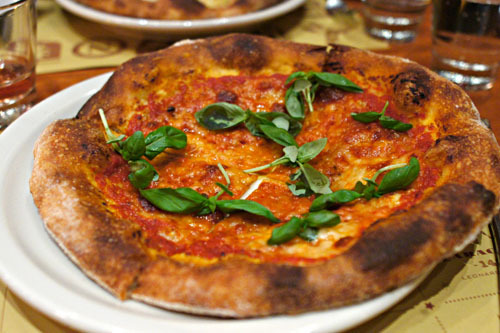 Margherita was awesome. 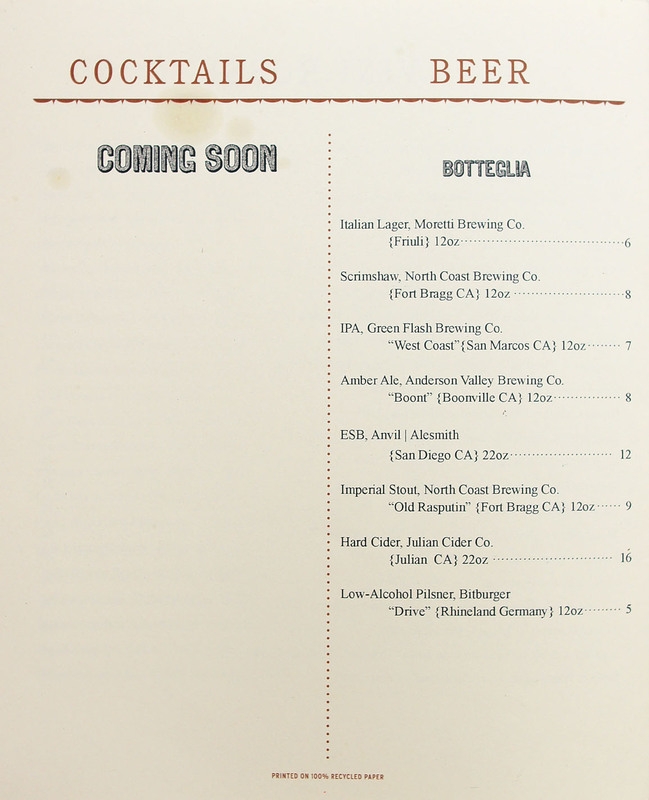 Beer was great (from San Diego). I am surprised you didn't get the pane. You mean Friday as in today? Probably going to meet up with an old friend for a casual dinner and some beers. What about you? 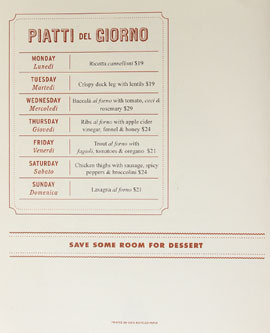 Glad to hear that you enjoyed yourselves here though--I had the marrow at the original Mozza and liked it too. Why the surprise about the pane though?